Why would it be necessary for the food industry to use the same additive in breads and cereals as what the chemical industry uses in the production of foamed plastics, synthetic leathers and rubber? We have been assured by our health regulatory agencies that azodicarbonamide is safe for use in our foods. If that’s the case, then why has it been banned in Europe, Australia and the United Kingdom? Azodicarbonamide is manufactured by the reaction of dihydrazine sulfate and urea under high temperature and pressure. The product of this reaction is then oxidized using sodium chlorate and centrifuged to yield a slurry containing azodicarbonamide. The slurry is washed to remove impurities and dried to obtain the azodicarbonamide powder. This is then micronized to a fine powder before packaging. Azodicarbonamide is used in the production of foam plastics like the gaskets around windows, shoe soles, and exercise mats. There are two different types of Azodicarbonamide – industrial quality and food grade quality. The industrial quality azodicarbonamide isn’t used in food, however the food grade quality is chemically identical. (1) As an aging and bleaching ingredient in cereal flour. (2) As a dough conditioner in bread baking. Azodicarbonamide is readily converted to biurea. In studies spanning over 1-2 years, rats and dogs received diets containing various amounts of biurea. In the 1-year study, rats and dogs ate diets containing 5 or 10% biurea (Oser et al., 1965 in Toxicology and applied pharmacology, 7:445-472). Most dogs from both dose groups died. Necropsy revealed massive, multiple renal calculi, bladder calculi, and chronic pyelonephritis. The main constituent (comprising 80-100%) of the calculi was identified as biurea. Toxicity studies conducted in experimental mammals demonstrate acute toxicity. Azodicarbonamide was also found to be a mutagen in bacterial systems. No adequate studies of carcinogenicity and reproductive toxicity, in animals or in humans, have been identified (yet), but case reports and epidemiological studies in humans have produced abundant evidence that azodicarbonamide can induce asthma, other respiratory symptoms, and skin sensitization in exposed workers. The main toxic effect of azodicarbonamide in humans is asthmagenicity. Evidence of this effect has been found from bronchial challenge studies and workplace health evaluations. There is also information to indicate that azodicarbonamide can cause skin sensitization in humans. The occurrence of semicarbazide (SEM) in foods including baby foods, packaged in glass jars and bottles, was first discovered by the European Food Safety Authority (EFSA) and industry through tracing the breakdown of azodicarbonamide. Due to this finding, the EFSA at that time in 2003 advised that SEM should be removed from baby foods as swiftly as technological progress allowed. This advice was based on findings that SEM is a weak carcinogen in mice and has weak genotoxic activity (i.e. potential to damage genetic material or DNA) in vitro. The implementation of an EC Directive banning the use of azodicarbonamide in plastics used as food contact materials went into force in 2005. In the U.K., the Health and Safety Executive body of regulation has identified azodicarbonamide as a respiratory sensitiser (a possible cause of asthma) and determined that products should be labeled as such. Both The United States and Canada permit the use of azodicarbonamide at levels up to 45 ppm which is simply an arbitrary number that studies have not been able to confirm or deny correlation dosage to disease in humans. Why Add This Ingredient To Bread and Cereals? Simply put, it keeps bread fresher, longer. That means more bread and cereals can stay on the grocery shelf for extended periods. But from my perspective, it is definitely another ingredient to be wary of. If any food additive is able to kill any decent size mammal (like a dog), that’s probably not an ingredient I would want to consume. Even a chemical that produces a disease such as asthma in its raw concentrated form is not tuned to the natural state of the human metabolism and does not belong in our food at any ANY dosage. The food industry has made it their business to remove all living components from natural foods, essentially creating foods that no longer have any active microbials, enzymes or even absorable vitamins and minerals. Processed foods are dead and that’s why they have no nutrient density. Processed foods can last months or even years due to the removal of all microorganisms, enzymes, oxygen, and moisture in food. 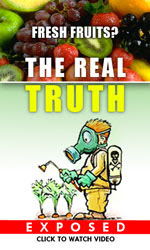 The more chemicals we add, inevitably the less nutrtion and the more risk with toxic overload. See 20 Ingredients To Memorize and Avoid In ANY Food You Consume for an excellent overview of artificial flavors, colors, preservatives, emulsifiers and sweeteners you should be avoiding. Our choices define our experience and we must all decide if we want a food supply that caters to convenience, packaging and shelf life, or one that caters to nutrition, health and wellness. Your body, your choice!